A group show featuring drawing-based works, Everything Exists Now (8th January – 18th February 2017) at Kristin Hjellegjerde gallery, brings together 13 artists who each reflect on their current moment through personal, political and historical viewpoints, united by the common lens of time. Hailing from different backgrounds and artistic practices, the final whole is a nod to the concept of Eternalism, a space in which each moment exists in and of itself, an endless loop in which all these points exist at once. If, indeed, the idea really is that Everything Exists Now, then all moments are present simultaneously. The artists are linked to each other by disparate yet complementary threads. Historicity, for example, finds life in the Research Lectures series of Chinese artist Zhu Wei, who critiques the darker side of a rapidly evolving China. Birmingham-based artist Barbara Walker’s ongoing Shock and Awe drawings bring to the fore the under-recognised role of black servicemen and women in the British Armed Forces and war efforts from 1914 to present day. The fractured politics of the present are parsed through British Chris Agnew’s new mixed media series, Hypnic Jerks, in which the physical phenomenon acts as a metaphor through which various socio-political events are examined, both personal and public. Also commenting on the present is Korean Sook Jin Jo’s powerful Je Suis series. Combining photography with ink, charcoal and gouache, they reference the recent violence in France, and stand as a symbol of strength, protection and freedom. Her work often has an environmental slant as well, something Celina Teague’s coloured pencil works also touch upon, with their preoccupation with the relentless and senseless slaughter of elephants and rhinos. Fragmentation, meanwhile, emerges in the work of Paris-based Moroccan artist Mohamed Lekleti. His Plastic Anagrams feature broken up hybrids; men, women, and body parts in montages uniting ecstasy and violence, as if viewing multiple timeframes at once. This sensation of disintegration finds a common ground in Saad Qureshi’s delicate plywood pieces. Much of his work looks to capture memories, examining how they are subject to constant revision, a chain of disconnected details that make up a past that is under constant scrutiny. The past is also found in Ali Kazim’s Ruins. These watercolour drawings illustrate the landscape outside of Lahore, once the flourishing Indus Valley, and now a desolate landscape that serves as a burial site, still dotted with ancient mounts and strewn with terracotta shards from a distant past. Two London-based artists deal with the cutting up and slowing of time: Marie Harnett takes moments from films, a fragment of time, to capture a split second film still, laboriously reproducing it in pencil, as in Karenina, making a moment exist forever. Caroline Jane Harris, meanwhile, has captured the fleeting composition of one of her pixelated hand-cut photographs. Slow Data (Window), is a drawing physically executed in layers akin to a 3D printer; the process reveals an image passing through the realms of the three-dimensional to the digital, alluding to the irreversible direction of time and technological obsolescence in our fast-paced age. Indeed, time moves, and it moves relentlessly. If Zhu Wei examines the effects of social change in China, then Ethiopian Dawit Abebe’s Mutual Identity mixed media works examine the impact of technology on individuals in his home country, but also the effect on social interaction as a whole. Norwegian artist Kristian Evju also meditates on change, creating a semi-fictional historical narrative in Punchcard, a series of drawings examining a near-distant past in which tech that was once so groundbreaking is already a place we cease to understand. Elsewhere, as in Sverre Malling’s latest drawings, fragments are drawn together from many sources: futuristic images converge with those from the past in a contradictory fashion. 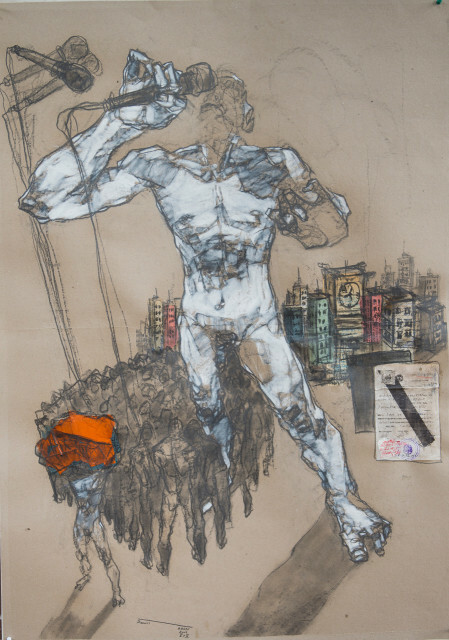 He seeks to translate into drawing using the collage form as a cognitive form of expression. These fragmented images exist in a state of flux, floating between concept, form and expression. Dawit Abebe (b. 1978) graduated from the Alle School of Fine Art and Design at Addis Ababa University. In 2001, he founded the Habesha Art Studio in his native Ethiopia, where he continues to be a full-time artist-in-residence. Solo exhibitions include Background 2 at Kristin Hjellegjerde Gallery, London (2015) and Background 1 at Lela Gallery, Addis Ababa (2014). His work is held in international private and public collections, including the Barjeel Art Foundation and the Rema Hort Mann Foundation. Chris Agnew (b. 1987) is a British artist known for his highly detailed drawings, and signature technique of icon panel etching. He received his BA from The University of Leeds in 2008, followed by an MFA from the Wimbledon College of Art in 2010. His works are held in collections including the V&A, London, and the Hearst Corporation collection, New York. Solo exhibitions include Dither (2016), The Mighty Grip of Fate (2014), with Kristin Hjellegjerde, London and The Pomp of Circumstances at Nancy Victor Gallery, London (2012). Agnew has a solo booth with Kristin Hjellegjerde at the 2017 London Art Fair (18-22 January), where he is debuting his new series 'Ba da, Dodă’, inspired by Brancusi and Brutalist architecture. 2017 will also see him begin a residency with Casa Jurnalistului (the house of investigative journalists), in Bucharest. Kristian Evju (b. 1980) is a Norwegian artist, making exquisitely detailed pencil drawings and paintings. He received his BA (Hons) Painting and Drawing from Edinburgh College of Art in 2007, followed by a Masters degree in Fine Art at Chelsea College of Art in 2011. His work received the Conté à Paris Drawing Prize at Griffin Gallery, and the Painter-Stainers Prize for Drawing at the London Group Open in 2015, in 2016 he was shortlisted for the Jerwood Drawing Prize and the Derwent Art Prize. Recent solo exhibitions include Grenselandat Gulden Kunstverk, Assemble:Dissemble at Lysbuen Museum of Art, and Lie Me a River at Ålesund Kunsthall - all in Norway (2015/16). Marie Harnett (b. 1983) is a British artist who studied drawing and painting at Edinburgh College of Art, from where she graduated in 2006. She is best known for her highly detailed and intricate drawings of film stills. Solo exhibitions include at Galleria Bonomo, Rome (2014) and Alan Cristea Gallery, London (2011). Harnett’s works are in international public and private collections including the Yale Centre for British Art, Connecticut; the Museum of Modern Art, New York and the British Museum, London. Caroline Jane Harris (b. 1987) using images gathered during encounters with her environments, employs traditional and digital image-making processes, to create complex artworks which slow the viewer's gaze. She received her BA (Hons) Fine Art Printmaking from the University of Brighton in 2009, followed by her MA (Distinction) from City and Guilds of London Art School in 2015, where she was awarded the Norman Ackroyd Prize for Etching and the Roger de Grey Drawing Prize. She has exhibited widely throughout the UK and internationally. Currently she is Artist in Residence at The Florence Trust, London, as well Research Printmaking Fellow at City & Guilds of London Art School. Art, New York; The British Museum, UK and the V&A, UK. Mohamed Lekleti (b. 1965) studied art in Rabat, and today lives and works in Montpellier, France. Passionate about drawing and reading, he focuses his work on myths. Lekleti embraces space in its totality, leading him, through progressive distortions and distortions, to the roundness of forms, to a dynamic deployment of his characters, which occupy the entire surface of the canvas. He has exhibited throughout France and abroad, including the USA, Korea, Belgium, Switzerland and his native Morocco, including as a laureate of the Drawing Now contemporary art fair in Paris in 2011, at the Torino Palace of Fine Arts (INAC) and the Forteresse de Salses, France (a national heritage monument). Sverre Malling (b. 1977) creates work notable for its precision and intricacy, entwining together references to classical art, botany, the occult, psychedelia, folk art and children’s illustrations. He graduated from the Oslo National Academ of the Arts in 2000, followed by the State Academy of Fine Arts, from where he graduated in 2004. Recent solo exhibitions include Satellites and Pomegranates, Galery Haaken, Norway (2014) along with exhibitions in France and Germany. Celina Teague (b. 1981) received her MA in Fine Art from Central Saint Martins College in 2007. Prior to this, she studied Fine Arts at the Universidad de Bellas Artes in Oaxaca, Mexico, graduating in 2005. Recent solo shows include I Think Therefore I # at Kristin Hjellegjerde Gallery, London (2015) and Brave New World Hits a Glitch at Rook and Raven Gallery, London (2013). Her work has been shown at various art fairs, and awards and residencies include a 2012 Takt Artist Residency in Berlin and inclusion on the shortlist for the 2013 Beers.Lambert Contemporary Visions IV. Saad Qureshi (b. 1986), through the various disciplines of sculpture, installation and drawing, probes issues of cultural belonging and separation – as well as universals that unite us beyond culture. Qureshi is fascinated by memory and time, and how they affect landscapes – both internal and external. He received his MFA from the Slade School of Art, University College London in 2010. Recent solo exhibitions include a site-specific installation for NOVA Project, London (2016) and Congregation, Gazelli Art House, London (2014). Barbara Walker (b. 1964) is a British visual artist. Her practice is inspired by the social, political issues, with particular reference to history and cultural differences in contemporary life. Working primarily in drawing and painting, her work addresses issues such as class, representation, power, and belonging. Walker was awarded a 1st Class BA in Art and Design by the University of Central England, Birmingham, 1996. Solo shows include Shock and Awe, mac, Birmingham (2016) and Sub Urban: New Drawings, University for the Creative Arts, Farnham (2015).Her works are held in private and public collections, including Wolverhampton Art Gallery, Arts Council England Collections, Birmingham Museum and Art Gallery and Usher Gallery, and upcoming exhibitions include the 2017 Diaspora Pavillion, Palazzo Pisani a Santa Marina, Venice. Zhu Wei (b. 1966) is one of China’s most visible contemporary practitioners of the post-Tiananmen period, known for his subtly quizzical critique of politics and society in a rapidly evolving China. Beijing-born-and-based, Zhu is principally a painter. As a teenager, Zhu entered the military, before painting propaganda art for the motherland, going on to study at the Beijing Academy of Film in 1992. He has exhibited worldwide, including at the Singapore Museum of Contemporary Arts, National Contemporary Art Centre of Greece and Asian Art Museum of San Francisco. Sook Jin Jo (b. 19XX) has exhibited internationally since 1984, and has been the subject of 30 solo exhibitions in the United States, Europe and Asia and over 100 group exhibitions. She received her MFA from the Pratt Institute, New York in 1991, prior to which she completed her MFA at Hong-Ik University, College of Fine Art, Seoul in 1985. Her work is included in private and museum collections including the Huntington Museum of Art, West Virginia; the Erie Museum of Art, Pennsylvania; the Housatonic Museum of Art, Connecticut; the National Museum of Contemporary Art in Korea; the Seoul Museum of Art, Korea; and The Margulies Collection at the Warehouse in Miami, Florida.